Orbital ATK‘s Cygnus spacecraft launched Sunday morning at NASA‘s Wallops Flight Facility in Virginia aboard an Antares rocket to bring approximately 7,400 pounds of cargo to the International Space Station. 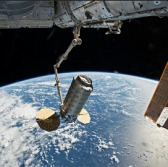 Cygnus lifted off at 7:19 a.m. Eastern time to deliver equipment, supplies and experiments to ISS crew as part of Orbital ATK’s eighth Commercial Resupply Services mission, the company said Sunday. The spacecraft, nicknamed S.S. Gene Cernan, is scheduled to arrive at ISS on Nov. 14 and stay attached to the station for three weeks before leaving with more than 4,000 pounds of disposable cargo. Astronauts will conduct microgravity research on the Cygnus spacecraft using the TangoLab reconfigurable research facility to demonstrate the capacity to expand ISS experiments. Once Cygnus departs ISS, the spacecraft will deploy 14 small satellites called Cubesats into orbit then conduct a destructive reentry into Earth’s atmosphere. Orbital ATK aims to help NASA deliver approximately 66,000 pounds of cargo to the space station under the CRS-1 contract. The company also secured the CRS-2 contract to perform a minimum of six cargo missions to ISS starting 2019.